Are you looking for a healthy, gluten free dinner recipe for your family they will LOVE? Imagine your family eating a healthy meal you made and they actually enjoy it. It is possible! Place the olive oil and chopped onion in a saucepan. Saute on medium/high heat until onion is soft and translucent, about 4-5 minutes. While the onion is cooking, place the cream cheese in the base of a stand mixer and beat with a paddle until smooth. Add the green chilies and beans and mix in until beans are slightly smashed. Add 2/3 of the onion to the cream cheese mixture. Set saucepan with remaining onion aside. Mix the onion and the shredded chicken into the cream cheese mixture. Place the saucepan with reserved onion back on medium/high heat. Add the enchilada sauce, garlic powder, sour cream, and salt to the saucepan and bring to a boil, whisking together until smooth. Remove from heat. Pour 1/3 of the creamy enchilada sauce into a 9x13 baking dish and spread to cover. Heat the tortillas for a minute in a frying pan or in the oven so they are soft and pliable and don't break when folding. Divide the cream cheese/chicken filling between 8-10 tortillas. Sprinkle a bit of shredded cheese on top of the filling in each tortilla. 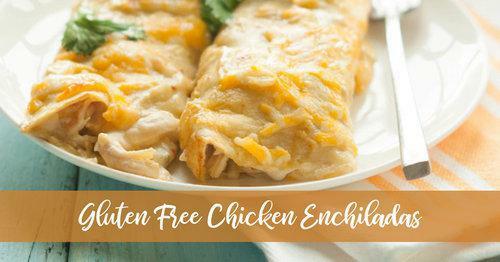 Roll up the tortillas into enchiladas and place side by side in prepared dish. Top the enchiladas with the remaining sauce, spreading the sauce across the tops of the enchiladas. Sprinkle remaining shredded cheese over the top. Bake for 35-40 minutes, or until cheese is melted and sauce is bubbling.